BSCT branded cable ties are manufactured using virgin nylon 6/6 to guarantee superior quality throughout the manufacturing process. 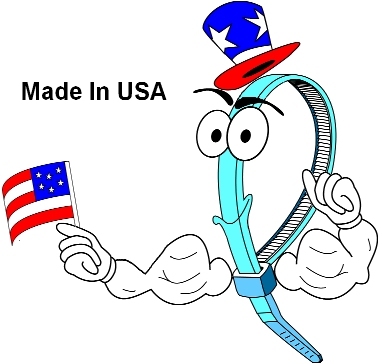 All our cable ties are UL Listed and Mil-Spec approved. General-purpose nylon 6/6 has increased resistance to ultraviolet light. Carbon black is one of the most effective stabilizers known today. A uniform dispersion of carbon black provides good ultraviolet light resistance without adversely affecting physical properties. The addition of carbon black, or any other ultraviolet light stabilizer, prolongs the useful life of plastic products used outdoors, but it does not totally eliminate the destructive effects of the light. Cable Ties - Click on Price to purchase.